• These results represent a notable improvement over what we have been seeing from the same group of companies in other recent periods. While growth reached the highest level in more than 5 years, a bigger proportion of companies have been able to beat estimates, particularly revenue estimates. • For the Retail sector, total Q1 earnings are up +1.7% from the same period last year on +3.1% higher revenues, with 60% beating EPS estimates and 50% beating revenue estimates. The sector’s Q1 results have been below other recent periods and are also among the weakest of all sectors this reporting cycle. 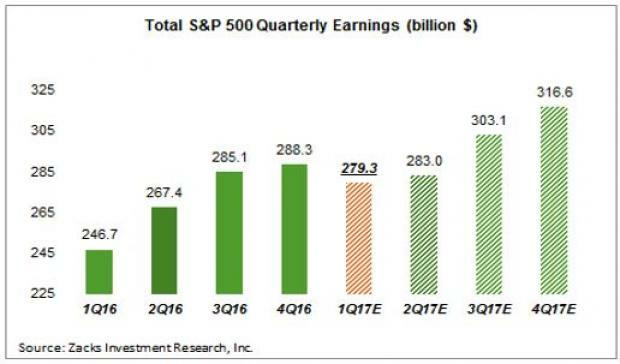 • For Q2, total earnings for the S&P 500 index are expected to be up +5.8% on +4.8% higher revenues. The Energy, Finance, Technology, Construction and Industrial Products are expected to be big growth drivers in Q2, with the quarterly earnings growth pace dropping to +3.1% on an ex-Energy basis. • Estimates for Q2 came down since the quarter got underway, but the magnitude of negative revisions nevertheless compares favorably to other recent periods. The chart below shows how estimates for Q2 have evolved since the start of the period. This trend of negative revisions ahead of the start of each reporting cycles is not new; we have been seeing this play out quarter after quarter for more than 3 years. The revisions trend has been moving in a favorable direction over the last two quarters and that same trend is even more at play in Q2 estimates. What this means is that while estimates for Q2 have come down, they haven’t come down as much as would typically be the case by this time in other recent periods. Estimates for 12 of the 16 Zacks sectors have come down since the start of Q2, with Consumer Discretionary and Utilities suffering the largest declines in revisions. Estimates for the Tech sector remain effectively unchanged, while estimates for Transportation, Construction and Industrial Products sectors have gone up. The positive revisions to Deere & Company (DE) and Caterpillar (CAT) are a big reason for the Industrial Product sector’s improved earnings picture. The actual Q1 earnings growth (+13.2%) turned out to be double the growth pace that was expected at the start of the reporting cycle (+6.6%). This magnitude of outperformance was unusual and above the recent quarterly trend. We know that actual Q2 growth will be higher relative to what is currently expected. 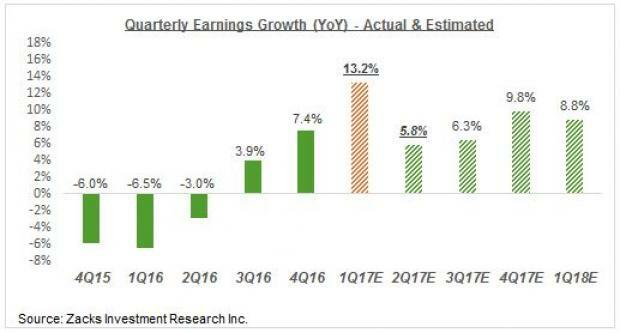 But even if actual Q2 earnings growth turns out to be as high as was expected at the start of the quarter (+7.9%), it will still be below what was achieved in Q1. 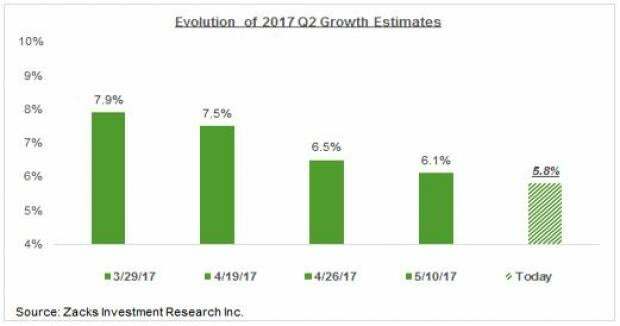 In fact, we can project with a reasonable level of confidence that the Q1 earnings growth pace will be the highest for the next few quarters. Earnings growth has undoubtedly turned positive now, but the quarterly growth pace in the coming quarters will likely stay below what we experienced in Q1. The chart below shows quarterly earnings growth expectations beyond Q2. Unlike the year-over-year growth pace, the dollar amount of total earnings are expected to be in record territory in the coming quarters, particularly in the second half of the year, as the chart below shows. Total Q1 earnings for the 492 index members that have reported results are up +13.5% from the same period last year on +7.2% higher revenues, with 72.6% beating EPS estimates and 65.2% coming ahead of top-line expectations. The proportion of companies beating both EPS and revenue estimates is currently 51.8%. The side-by-side charts below compare the growth rates and beat ratios for the 492 index members with what we saw from the same companies in other recent periods. The comparison charts above show that growth as well as positive beats are tracking above historical periods. The proportion of companies beating revenue estimates is particularly notable, as is the revenue growth pace. Please note that the positive Q1 results are broad-based and not narrowly concentrated. Sectors that beat revenue estimates at a proportion higher than the average for the S&P 500 index, which itself tracked above historical periods, included Autos (90% beat revenue estimates), Conglomerates (83.3%), Industrial Products (81.8% beating revenue estimates), Technology (78.3%), Basic Materials (75%), Transportation (73.3%), Construction (69.2%), Utilities (69%), Medical (67.9%), and Finance (68.1%). The Consumer Staples operators appeared to struggle, with the proportion of Consumer Staples companies beating revenue estimates the lowest of all 16 Zacks sectors.